July 27 – August 2 – Craig and L'Or L.
What a great week! We had fewer students visiting because of semester finals, but that gave us time one day to enjoy a quiet lunch out on the Institute porch. A peaceful lunch together was a welcome treat! Another day Sean stopped by after his rugby”training”(practice), and gave us a Rugby 101 lesson. So if you know what Try, Prop, Hook, Pitch, Fend, Feed, Wing, Number 8, Centre, Conversion, and Scrum all mean, then you’re almost a Rook! (someone who has great knowledge about Rubgy League). But there’s also Rugby Union with different rules, and understanding Sevens, Eleven and Fifteen. What a game! Sean has a contract to play Rugby League in Australia in December. 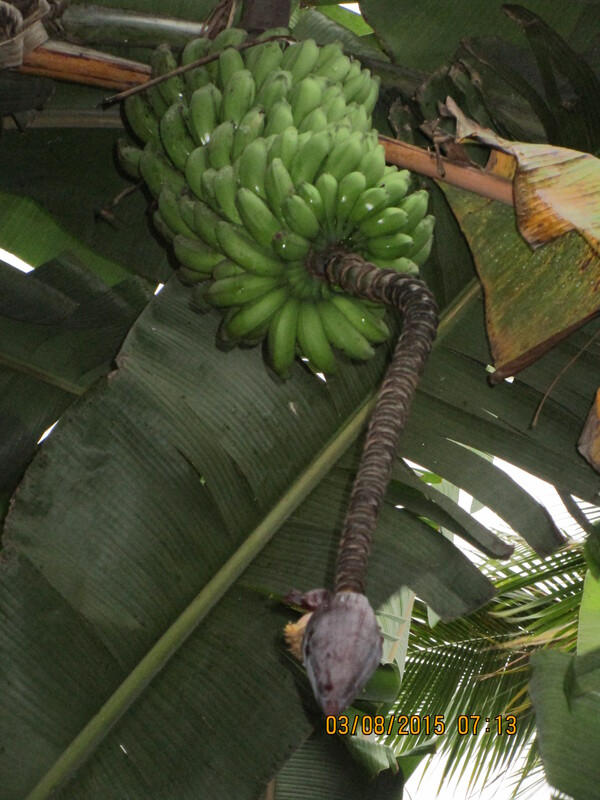 Purple inflorescence or blossom at bottom of stem where bananas have already been picked, and green bananas ripening. 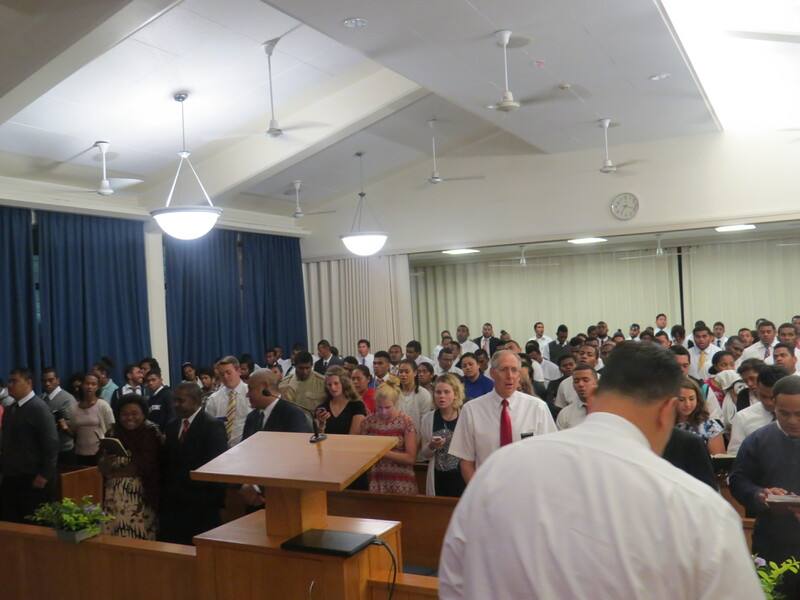 Thursday we had a wonderful lesson about prospective missionaries preparing to enter the temple. We watched a great video, “Mormon Temples: A Conversation with a Church Leader,” (which shows the Suva Fiji Temple, and lots of people we know here), and we talked about the new Church video, “Sacred Temple Clothing,” which does a wonderful job explaining temple garments. Chelsea, Jeanette, Sumeet, Manny and Seta, all preparing for the temple – which opens in 203 days! 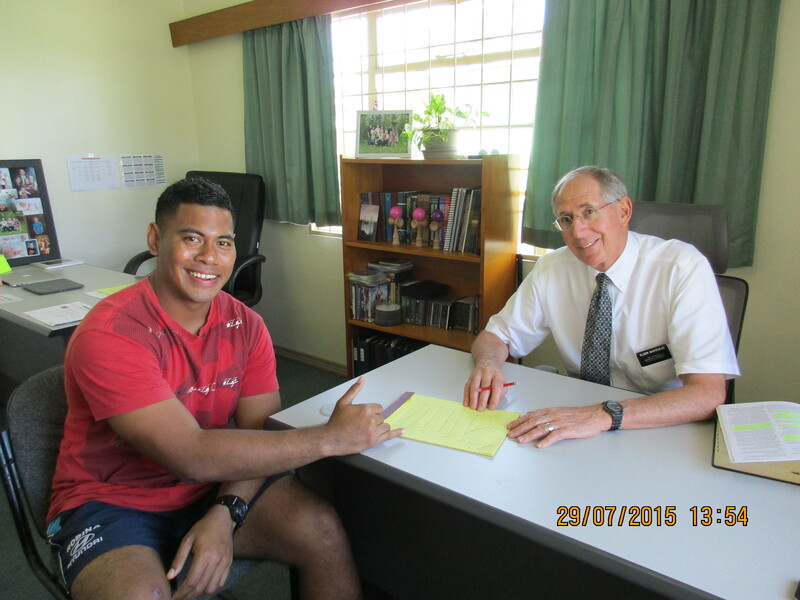 Elder Whitehead was invited by a Major Rivera to come to the United States Embassy just a few blocks up the street from our Institute and the Suva Fiji Temple. 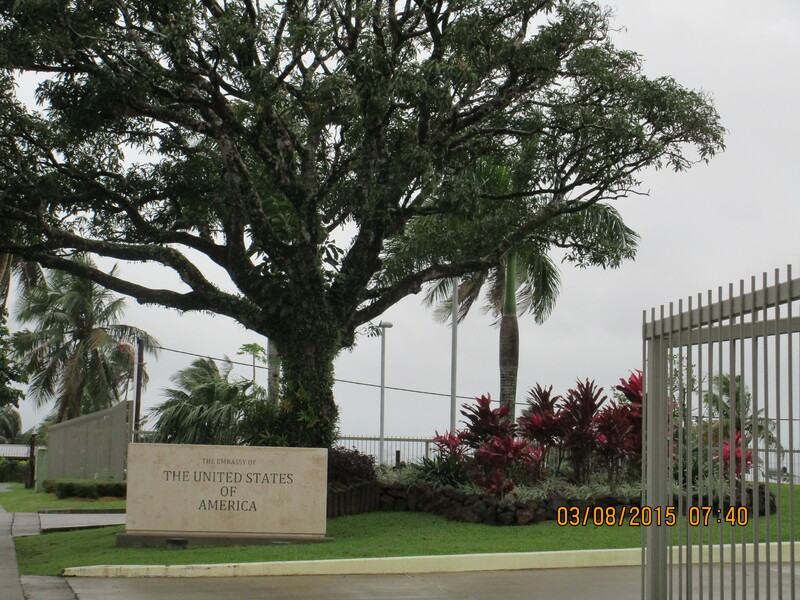 He had a great visit and lunch, and learned lots about what is available there for all of us expats. While he was taking the tour I went to the Family History Center, and actually found a name to take to the temple – a pretty exciting day! Friday evening we had dinner with some other senior missionaries, and talked about some fun outings on our Fiji “bucket list” we could plan and do together. We had a packed house on movie night – too many to even fit into the room! Lots of new faces. Mele organized a reunion of some his classmates from LDS College, and they were fun to meet. 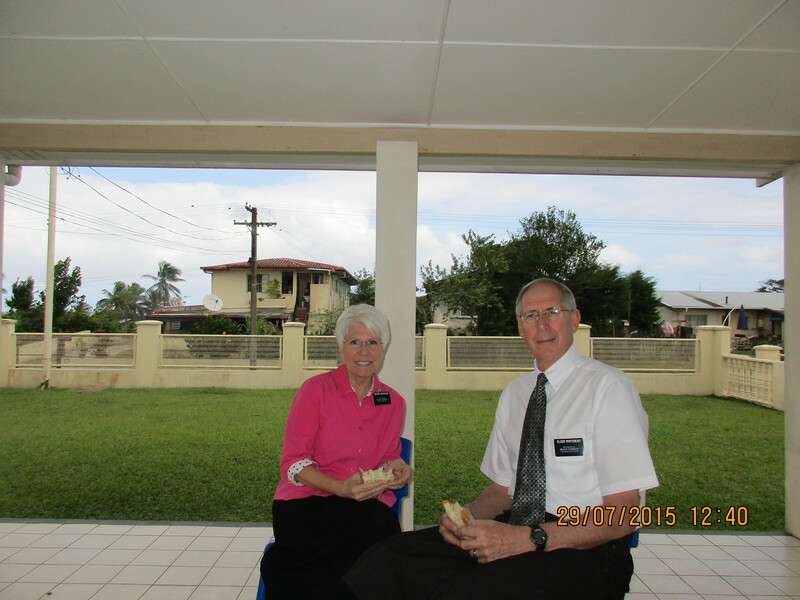 The highlight of the week was incredible Family Home Evening with Elder Adolf Johansson of the Seventy. 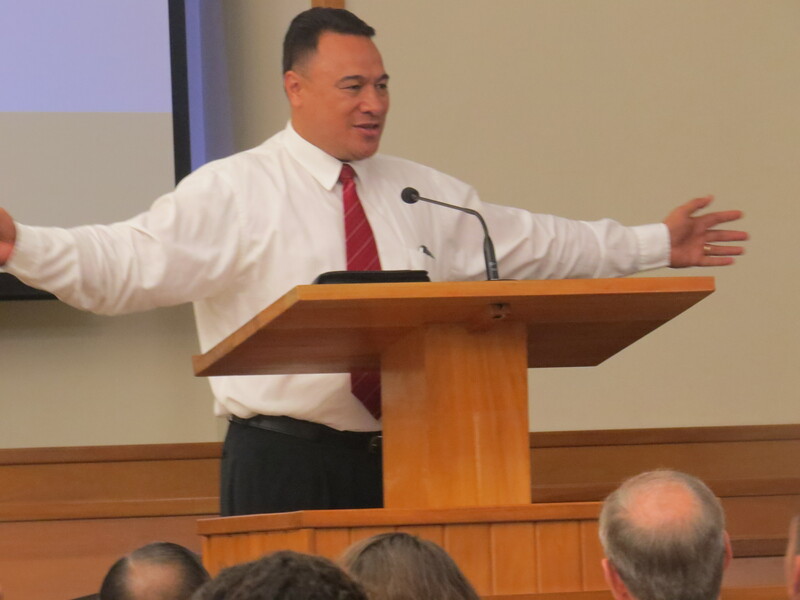 He spoke about how missions prepare you for life, overcoming pacific island traditions that hinder marriages (like prejudices of one island group for another, or going into debt to feed pig to the entire village at a wedding reception). He said we are not Tongans, Samoans, americans, etc., we are all children of Christ. He also talked about magnifying our talents, and having the faith to act on what we feel is right. 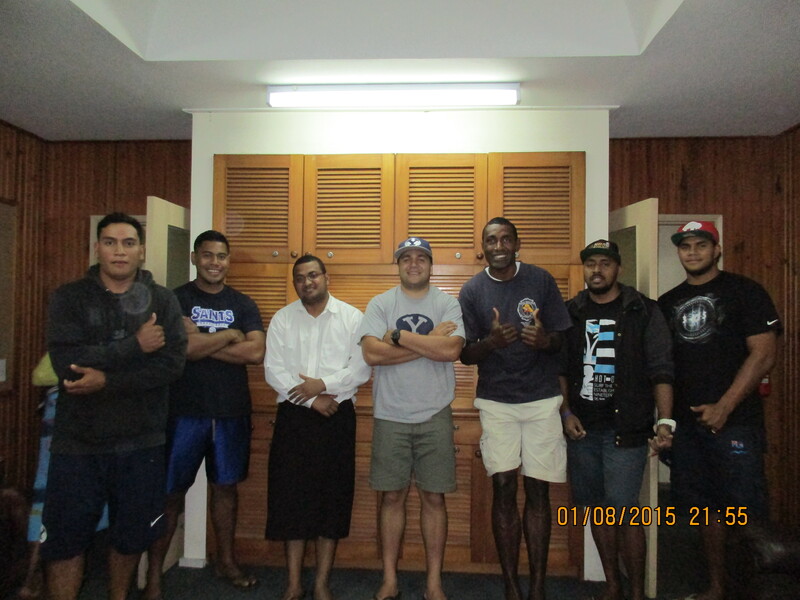 The YSAs from Nausori rented two small busses to come! It was a very rainy night, but the chapel and overflow were so full we had to set up chairs outside the chapel doors. A packed chapel Sunday night! 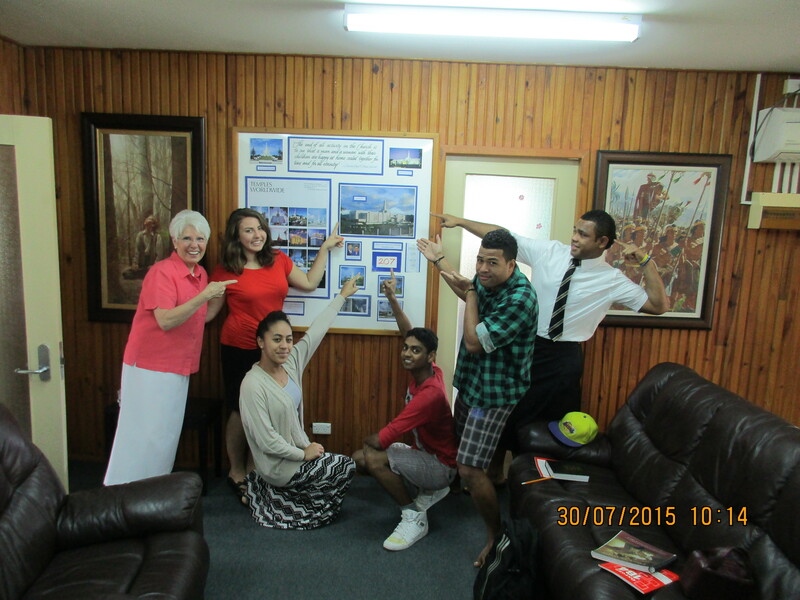 Elder Johansson was a hit! I baked cakes all Saturday, served 176 pieces, and yet still ran out! But we’ll work with our institute council and figure out a way to make sure everyone is served something next time. Everyday we learn something new – we’re so thankful to be here!